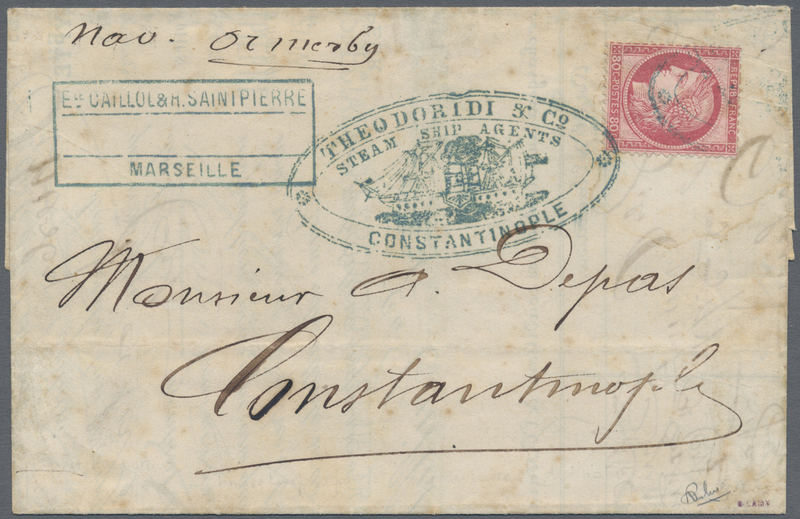 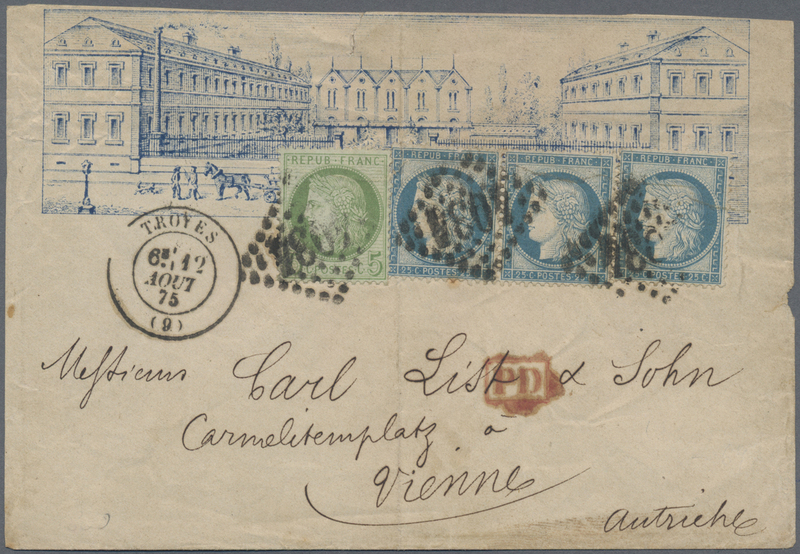 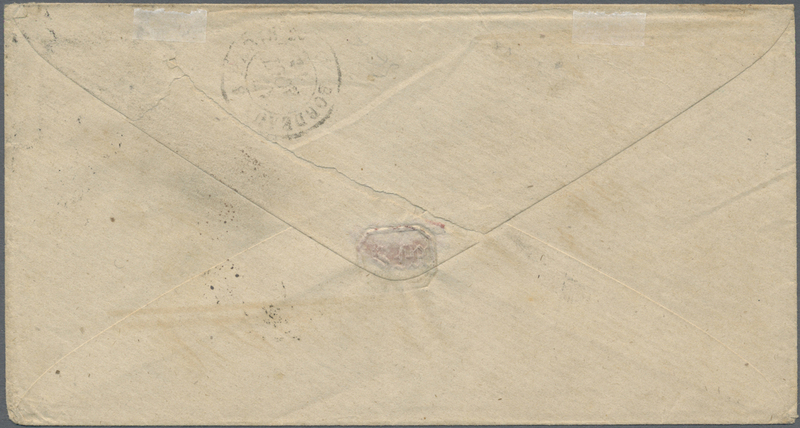 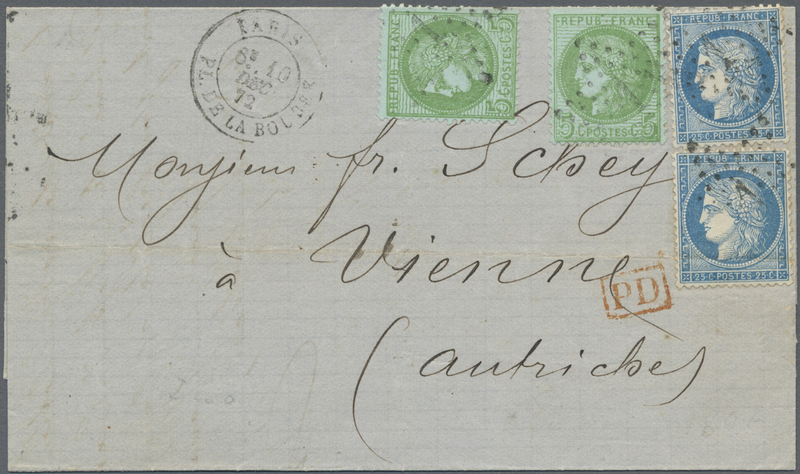 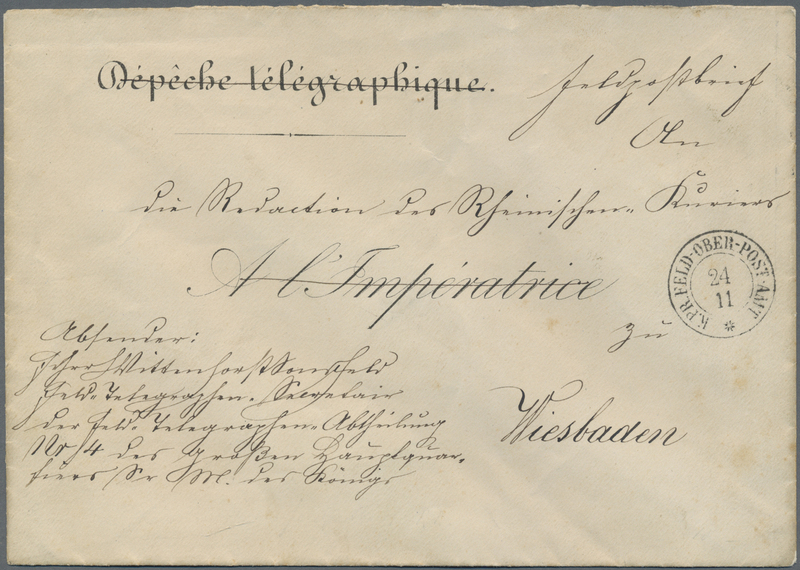 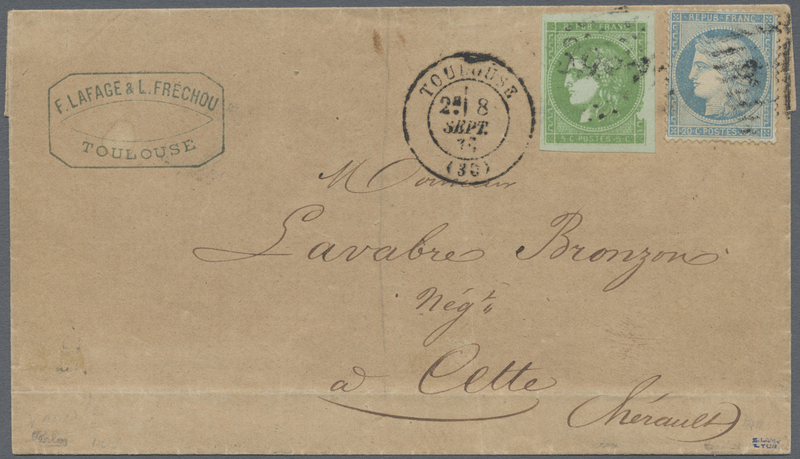 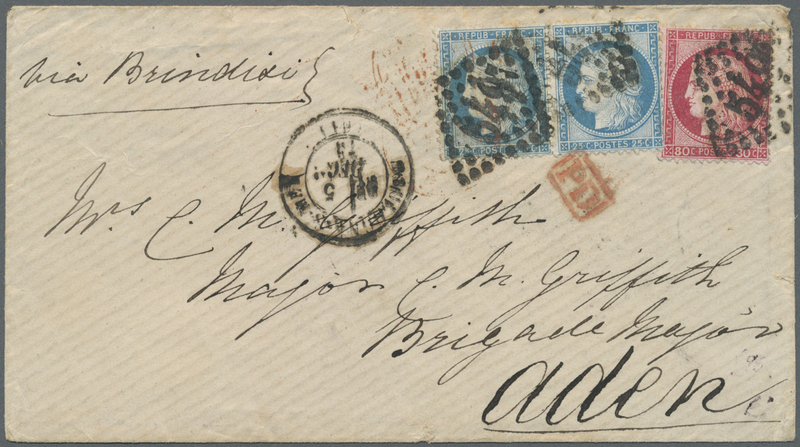 15629 Brief (cover) 48, 51(3) 1875 Illustrated envelope (probably depicting a factory in Troyes) used from Troyes to Vienna, Austria via Paris-Belfort, franked by 1871 Ceres 5c. 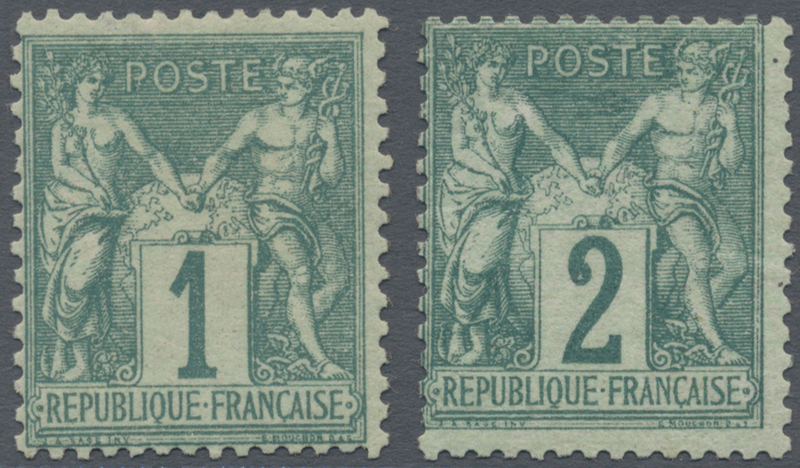 green and 25c. 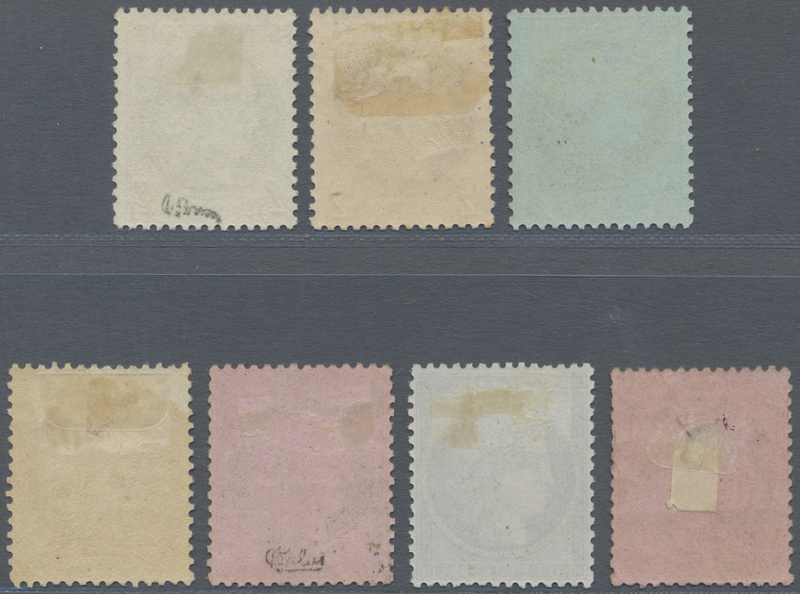 blue pair and single all tied by numeral "4034", Troyes '12 Aug 75' despatch cds and red boxed "PD" alongside, French transit datestamps as well as Vienna '16 Aug 75' arrival cds on the reverse. 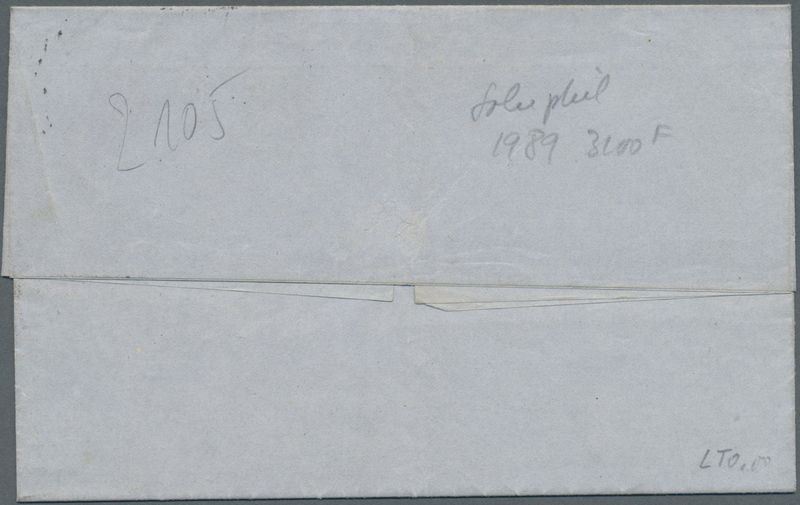 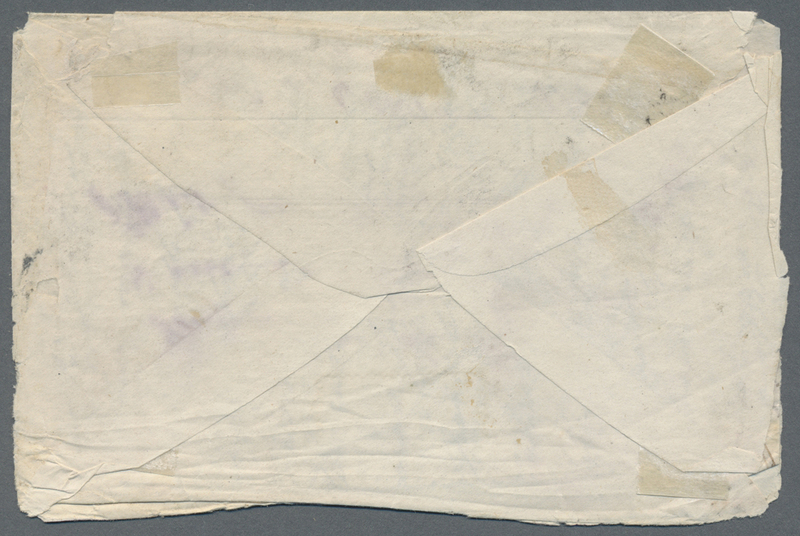 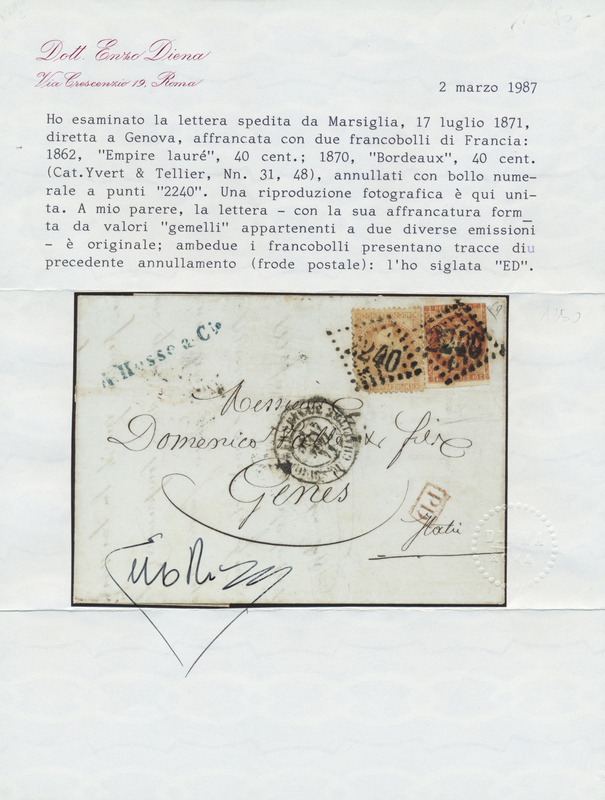 The envelope with a central vertical fold affecting one of the 25c. 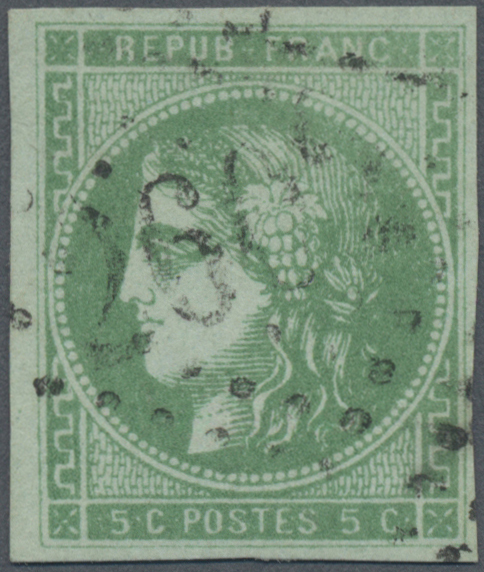 adhesives and minor traces of usage/ageing but still an attractive and most decorative cover shortened on top. 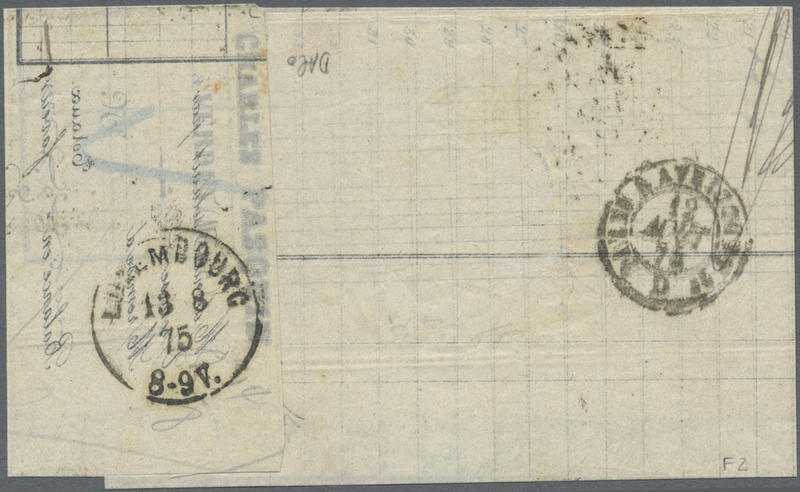 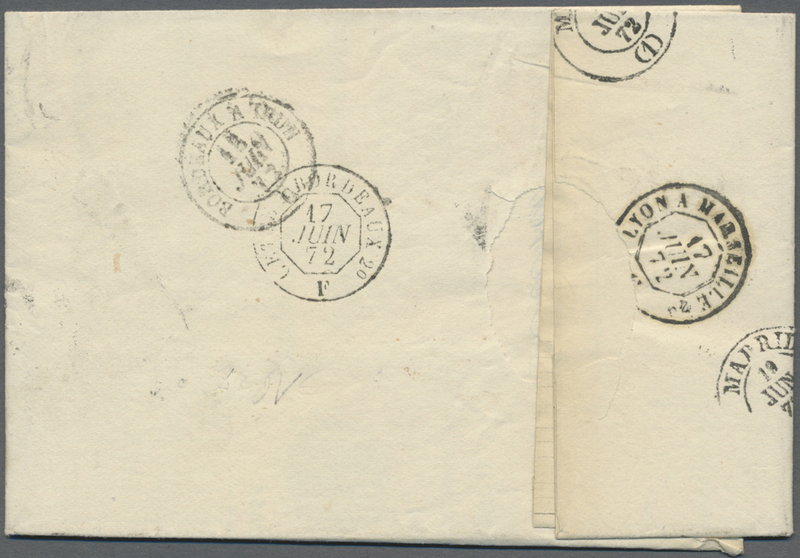 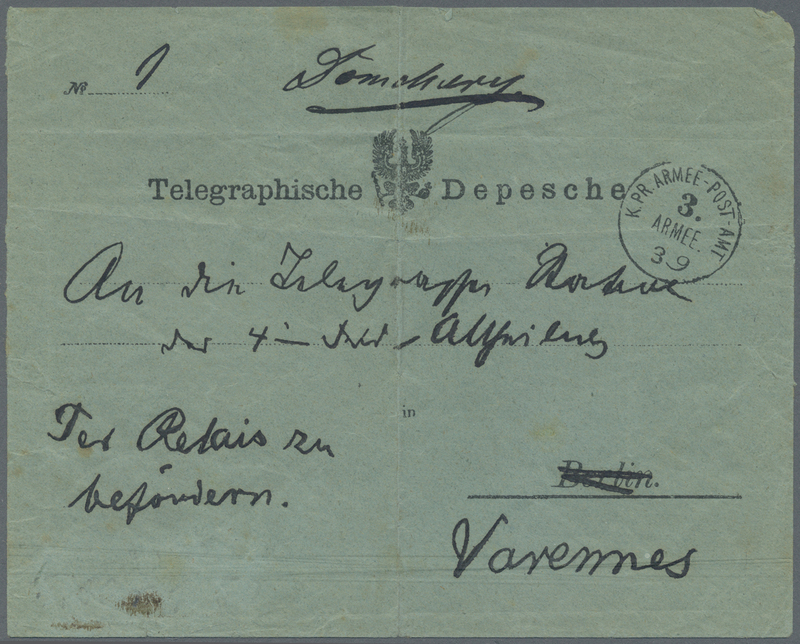 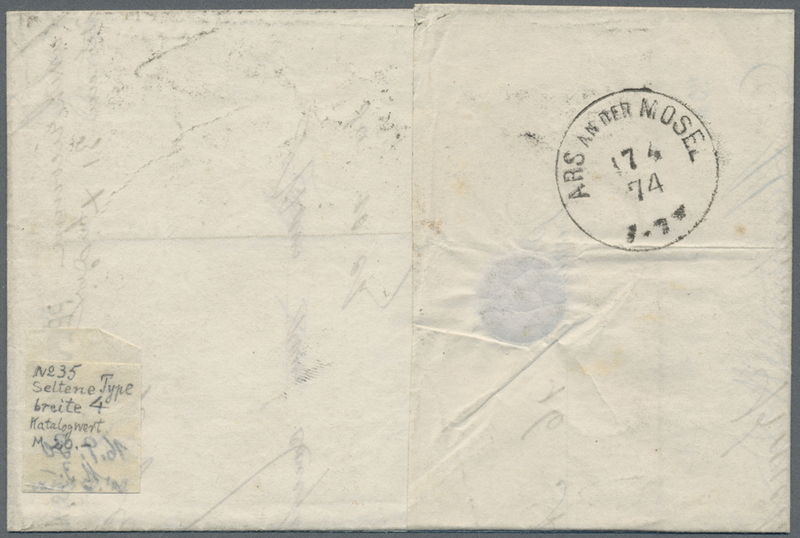 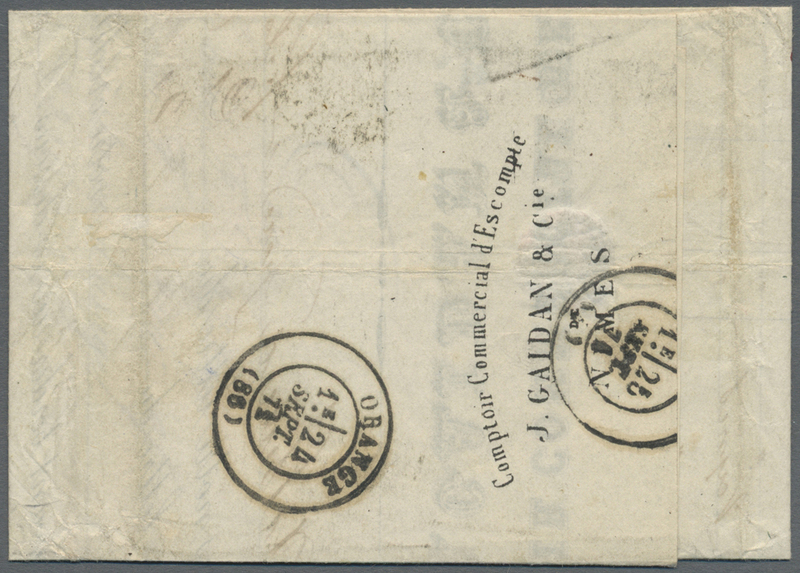 15637 Brief (cover) 51, 55 1873 Cover from Boulogne-sur-Mer to ADEN via Paris and Brindisi, franked by Ceres 25c. 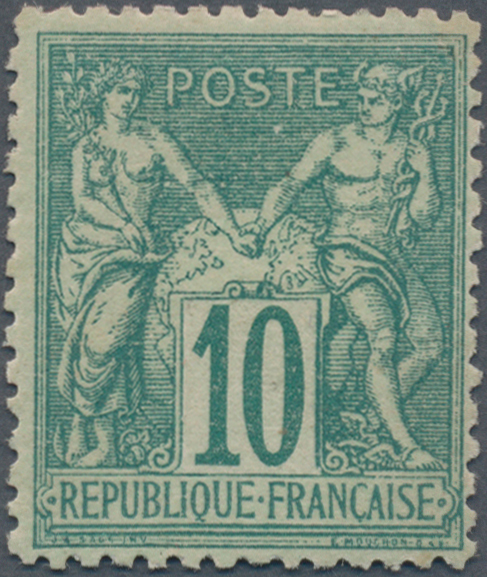 pair and 80c. 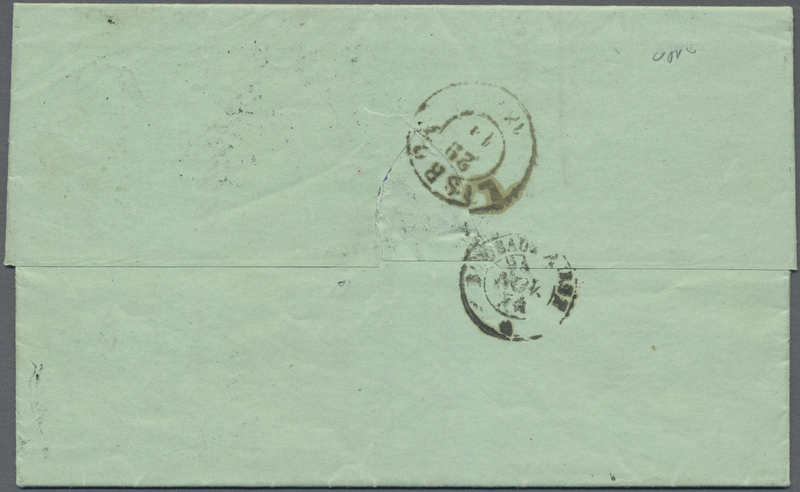 all tied by "549" numeral, with '5 Dec 73' despatch cds and boxed "PD" in red alongside, and on the reverse with several French transit and Aden Steamer-Point '13 Dec 73' arrival datestamps. 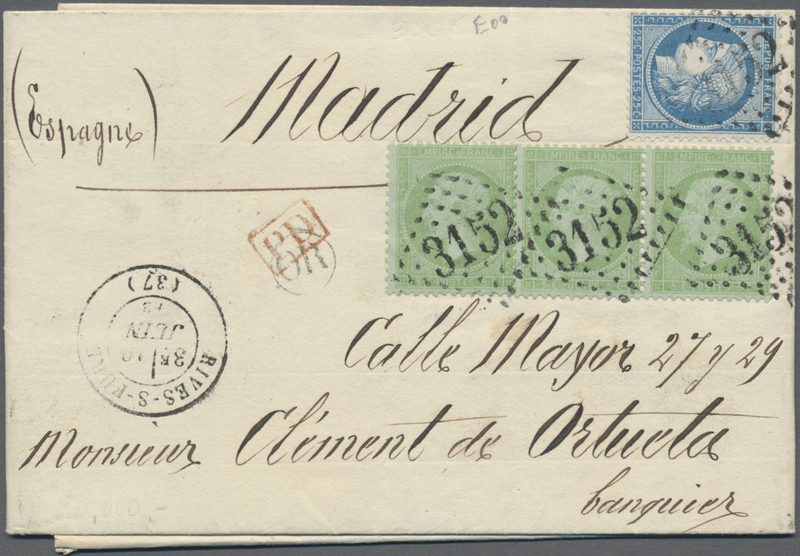 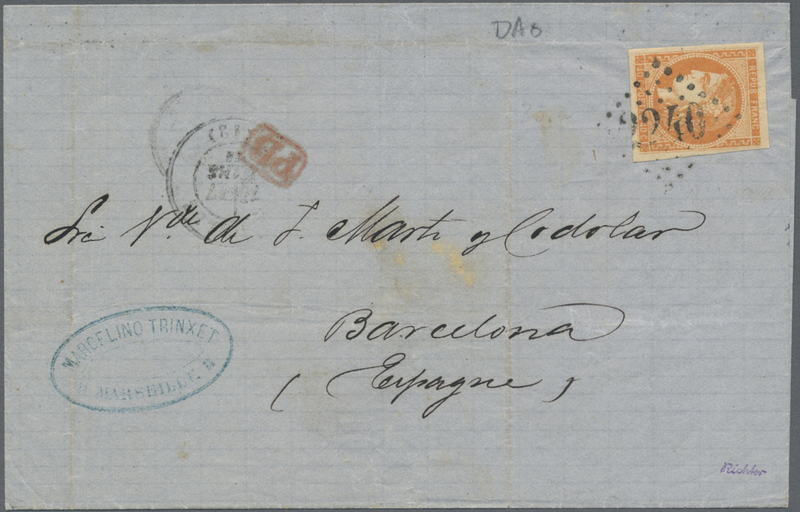 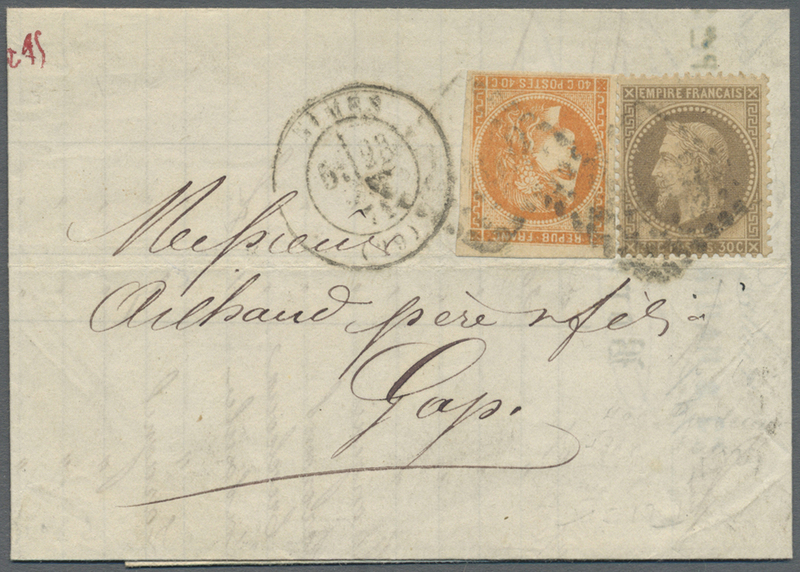 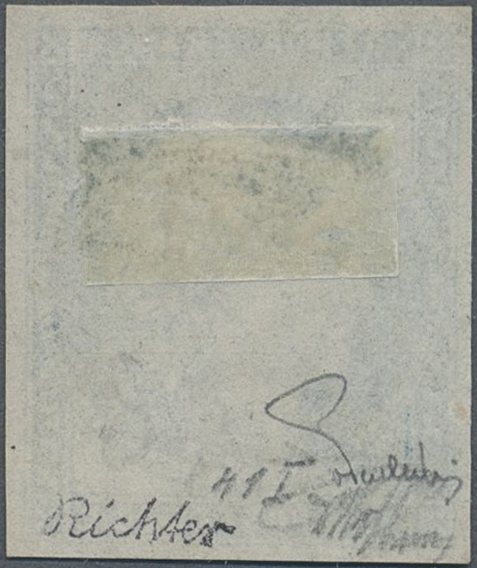 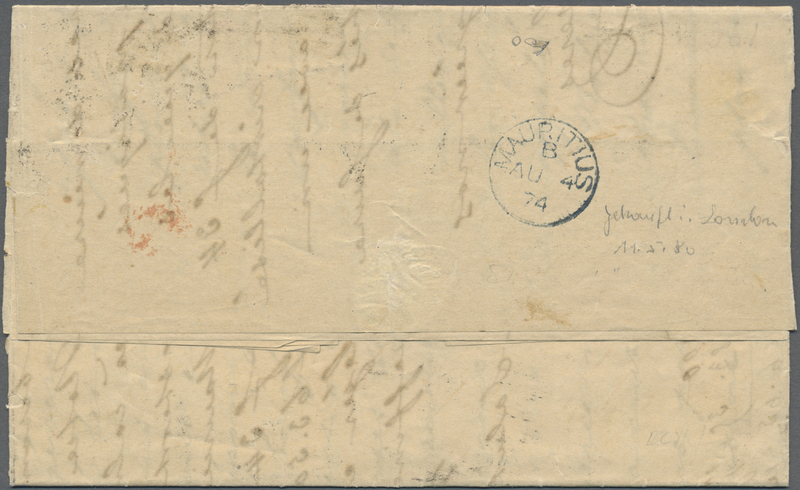 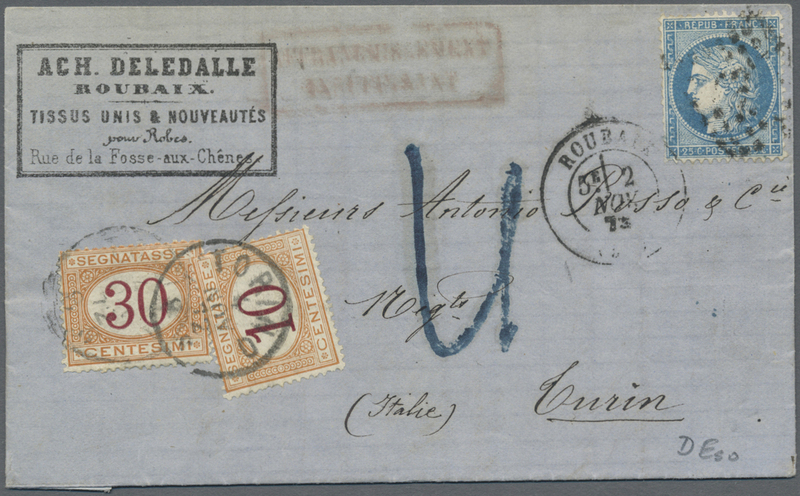 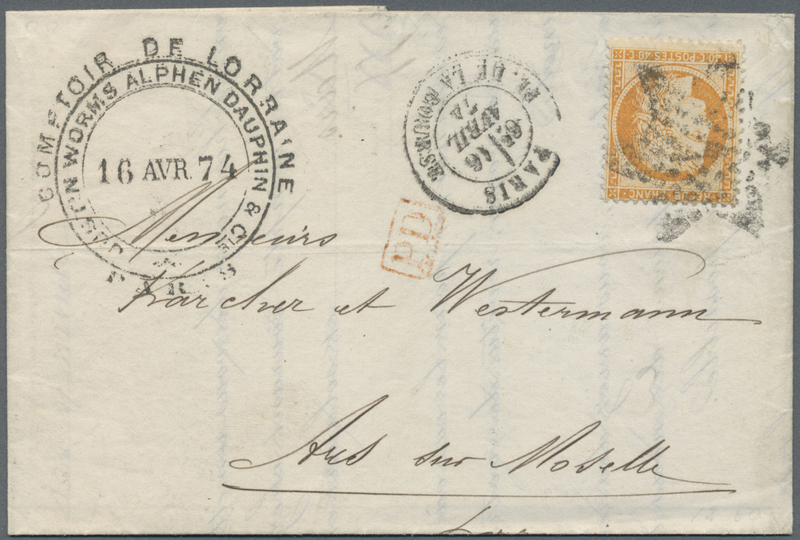 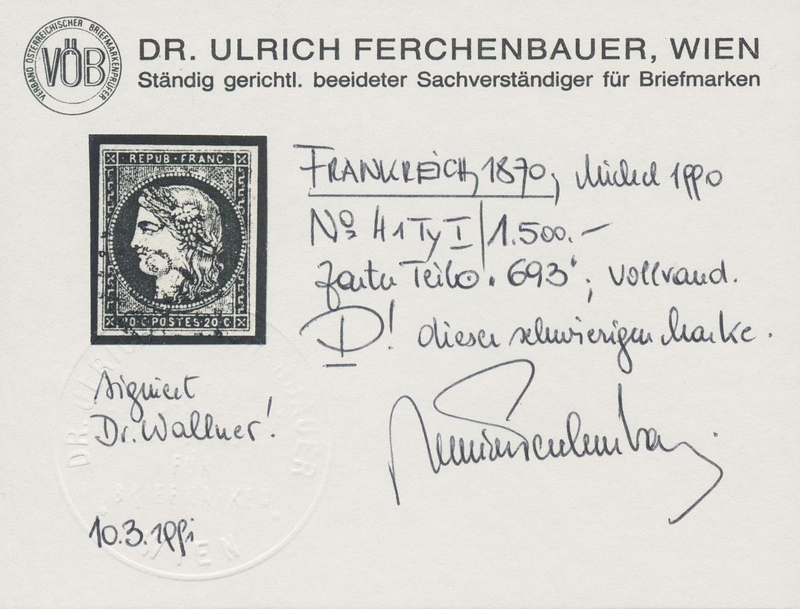 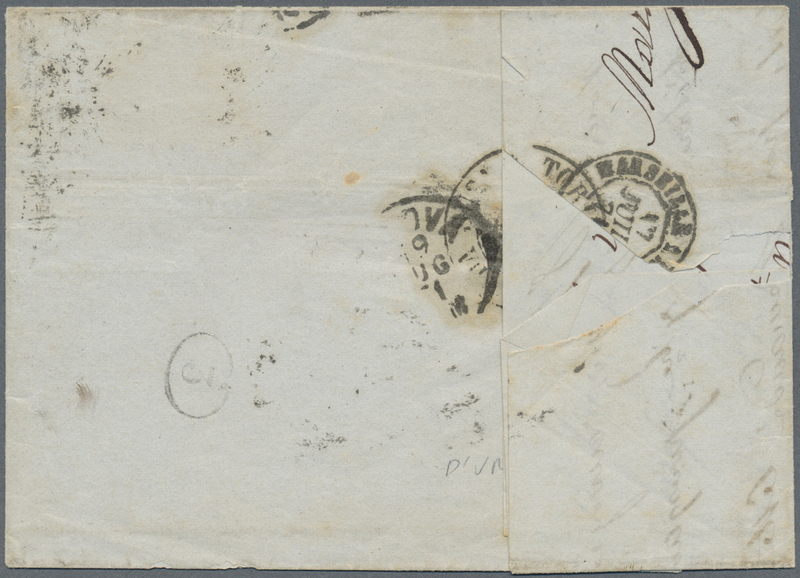 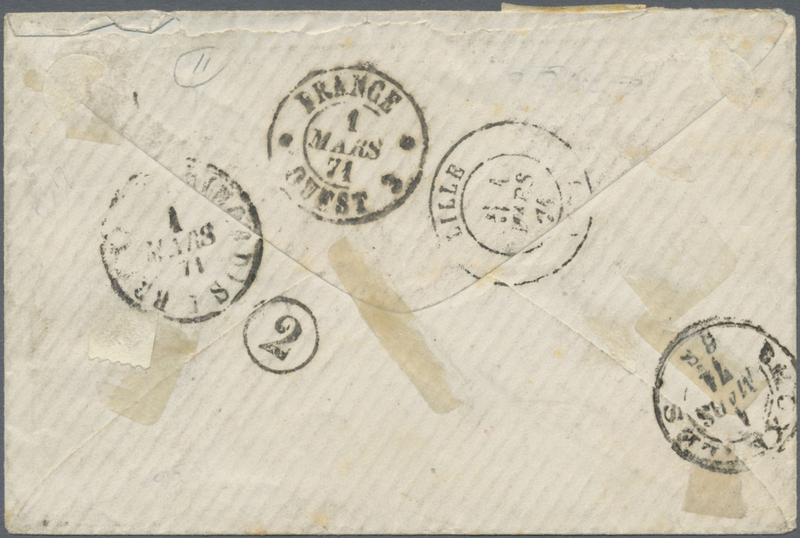 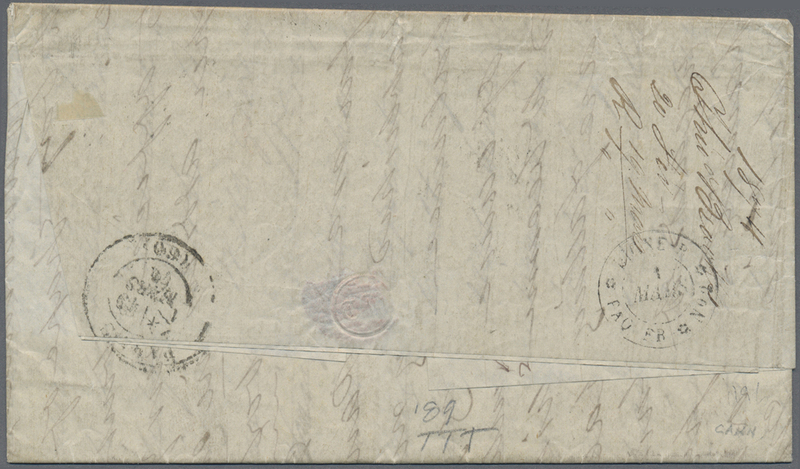 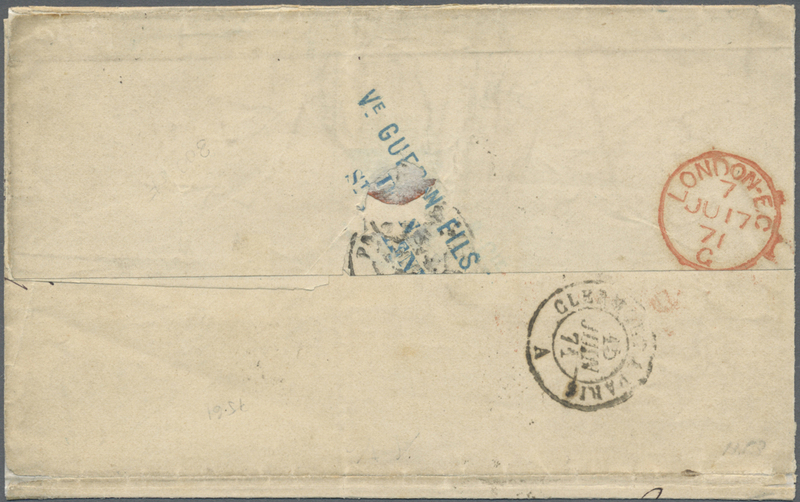 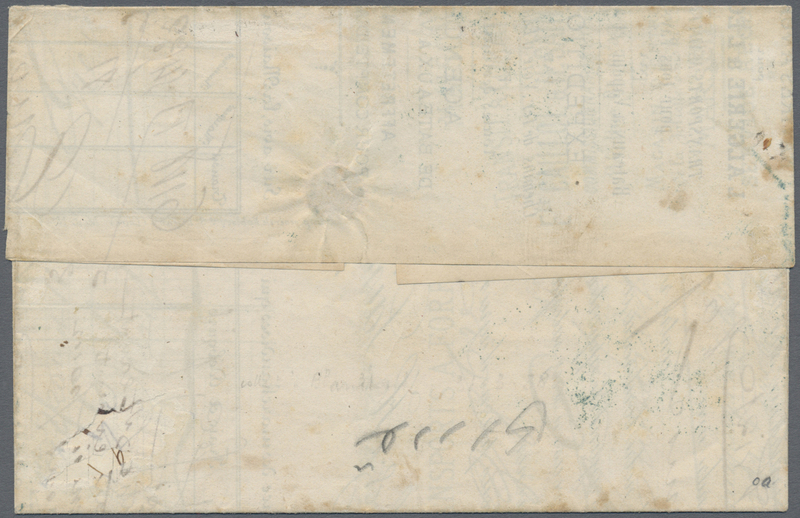 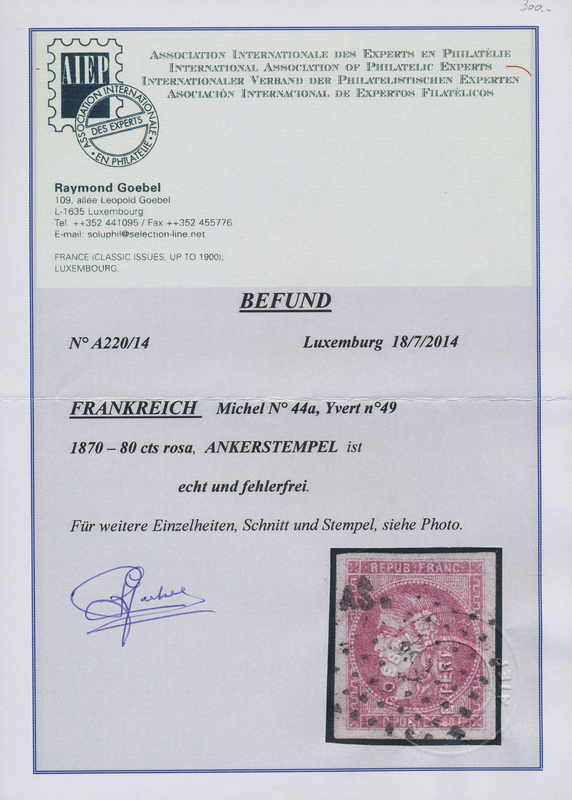 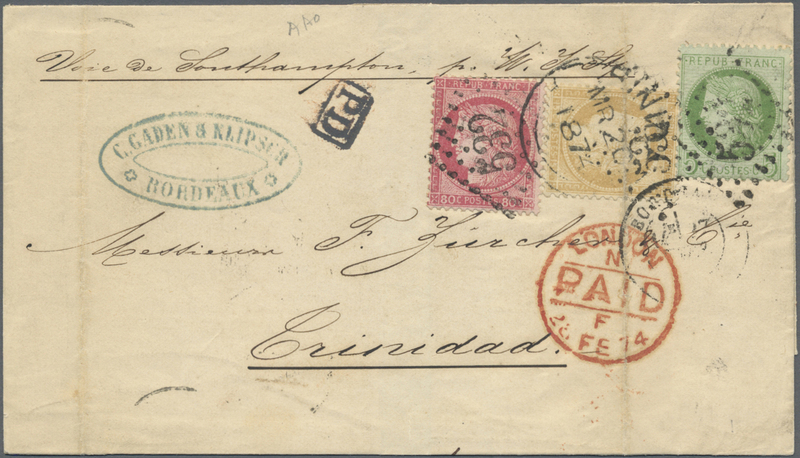 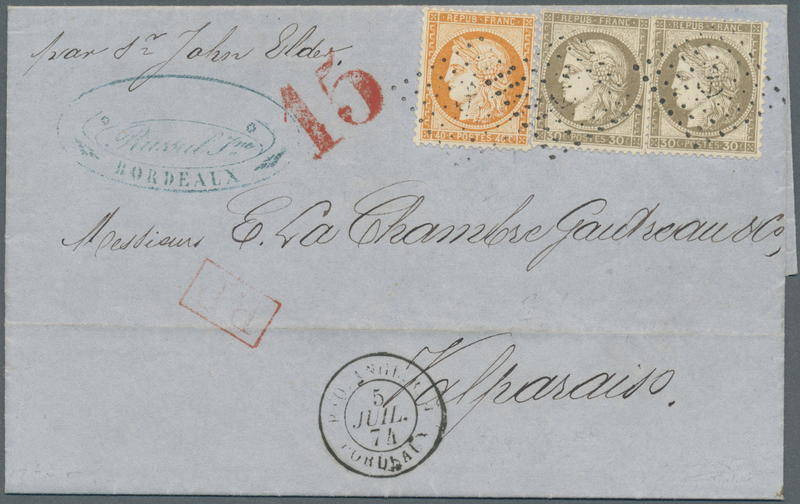 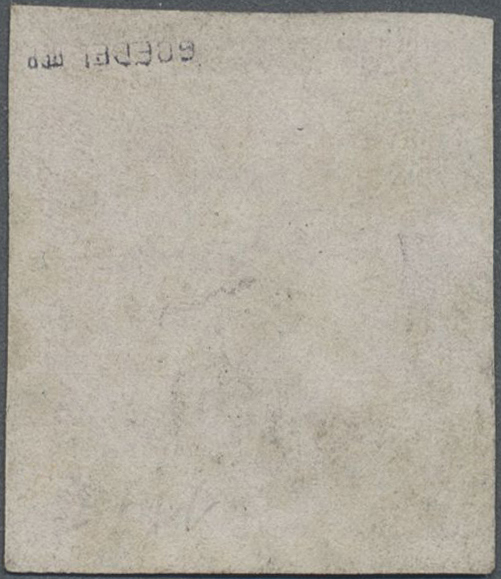 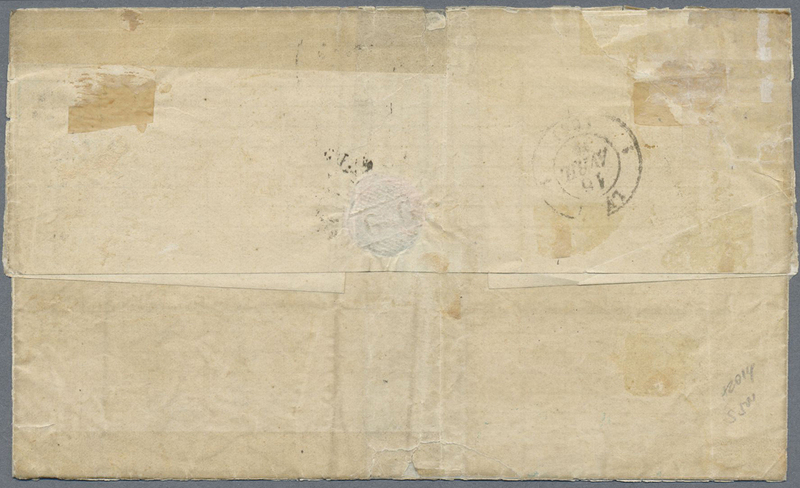 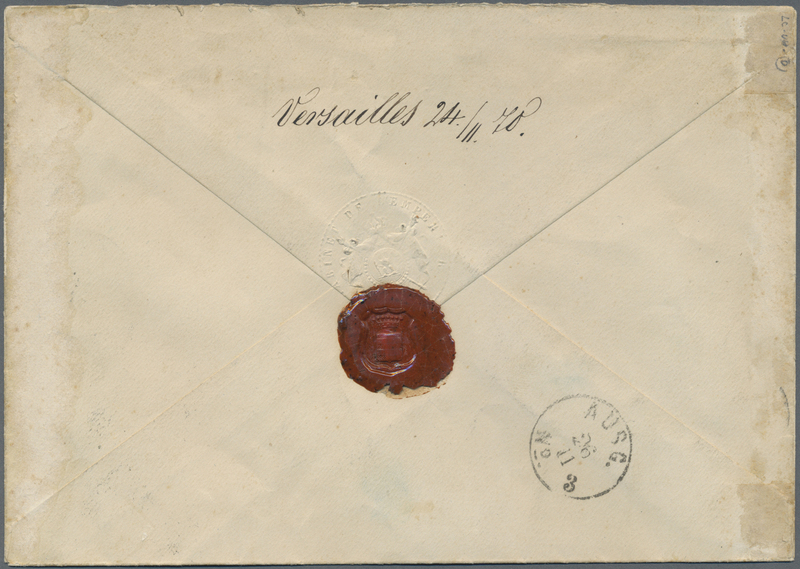 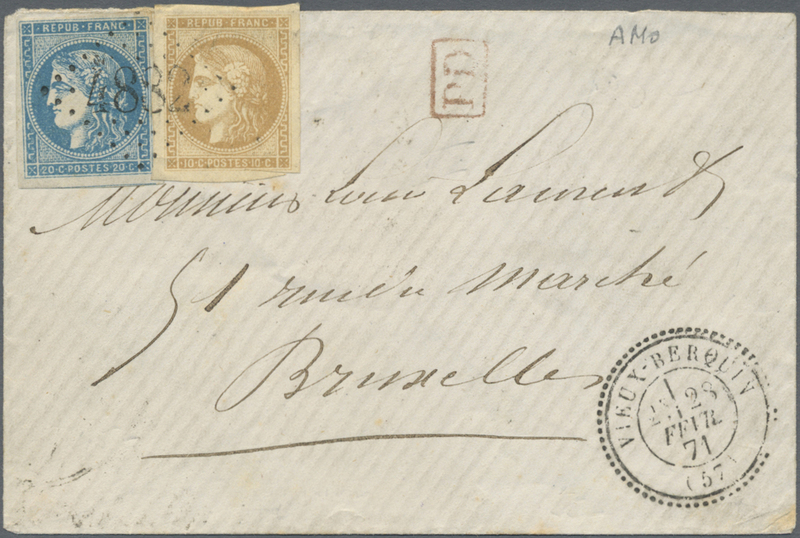 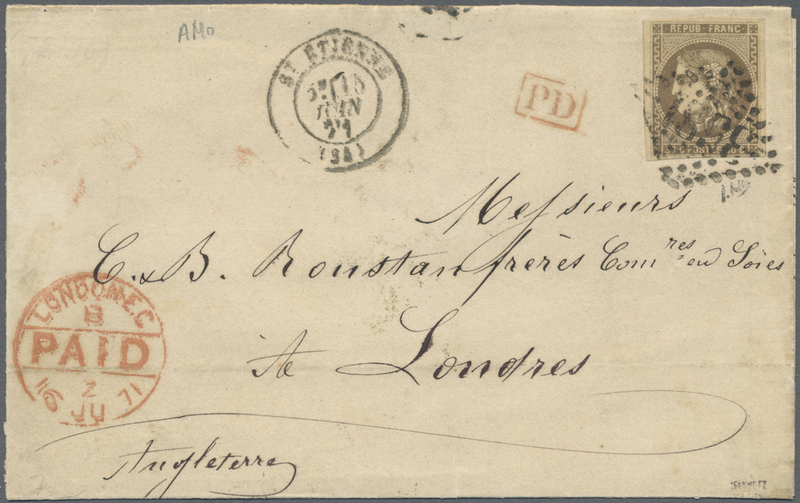 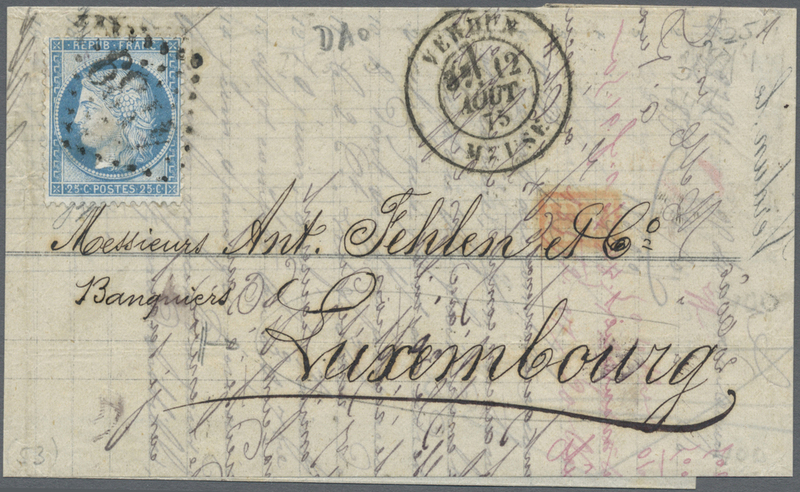 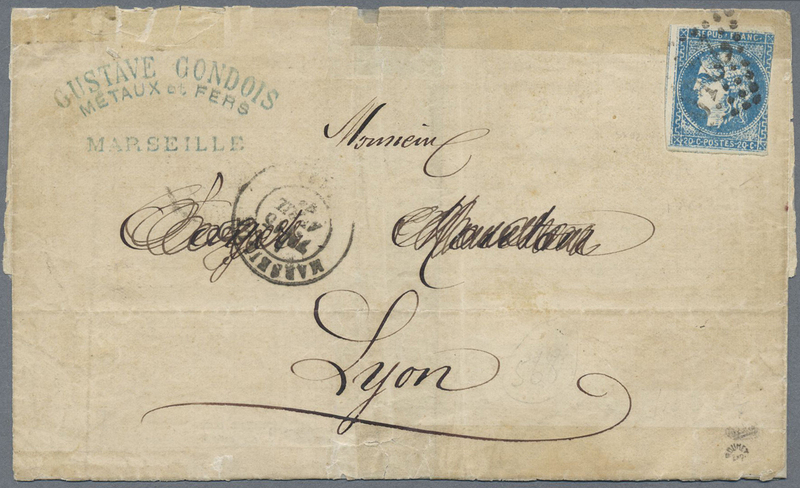 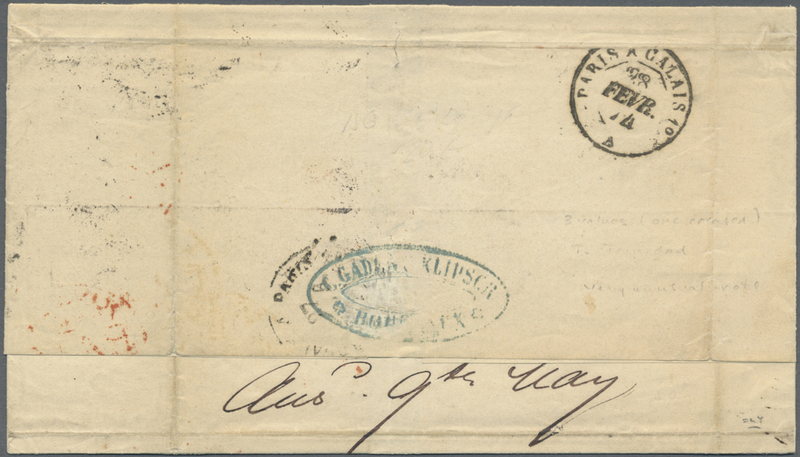 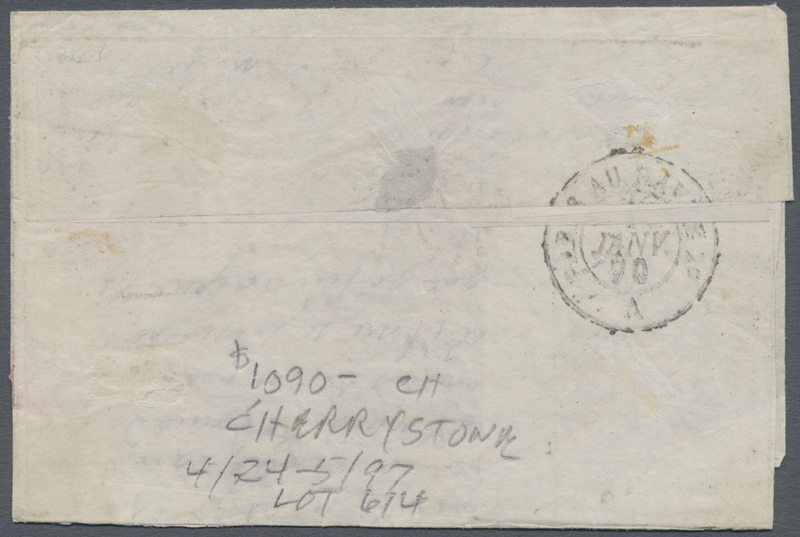 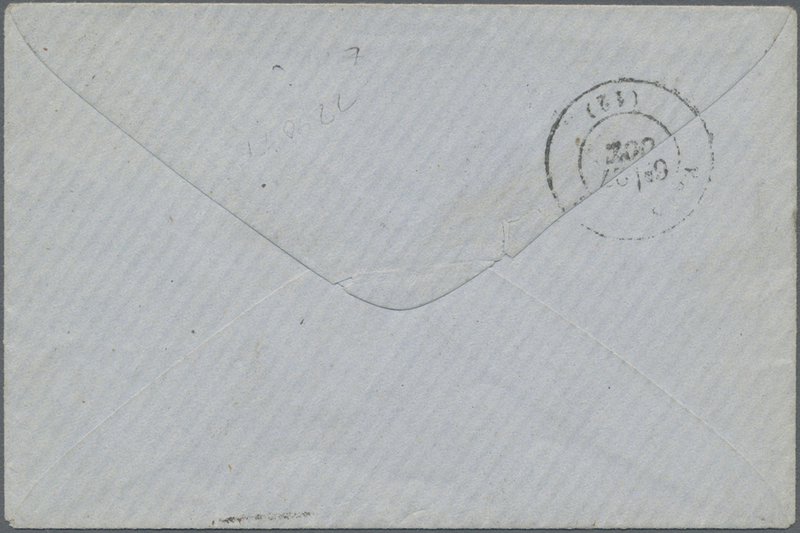 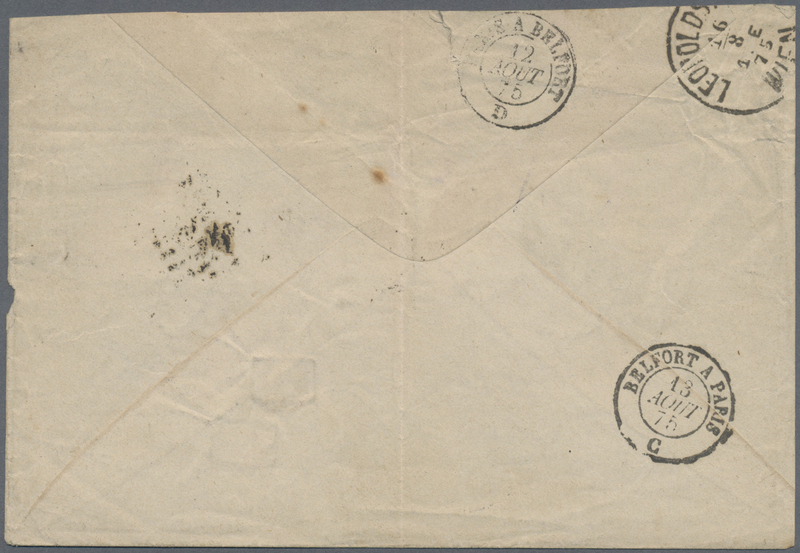 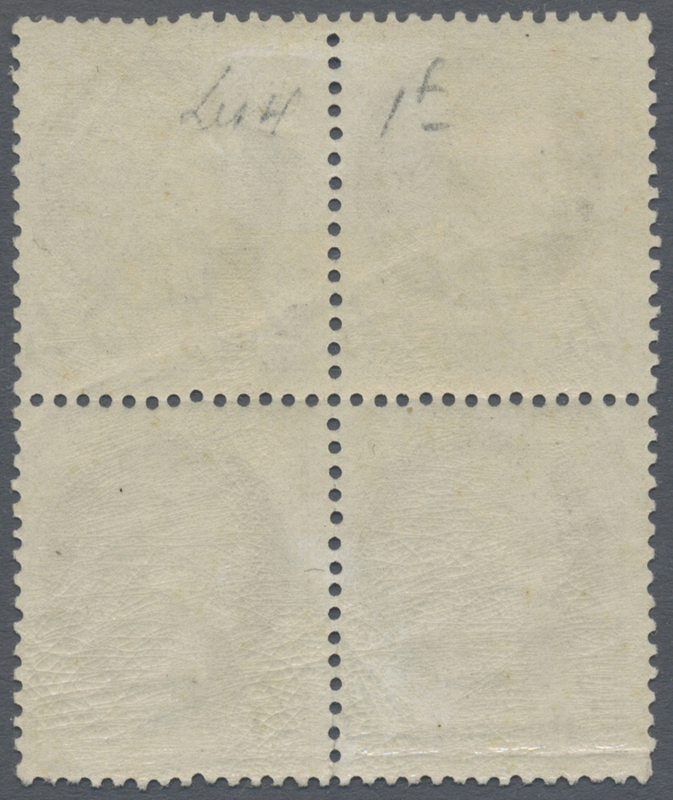 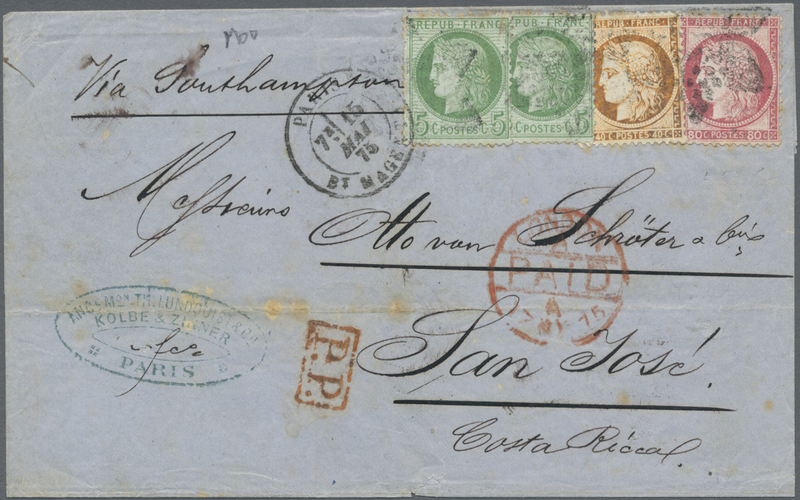 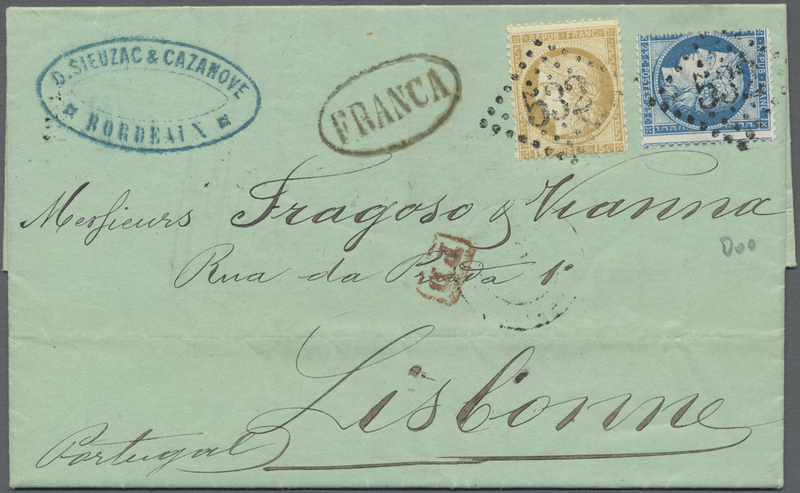 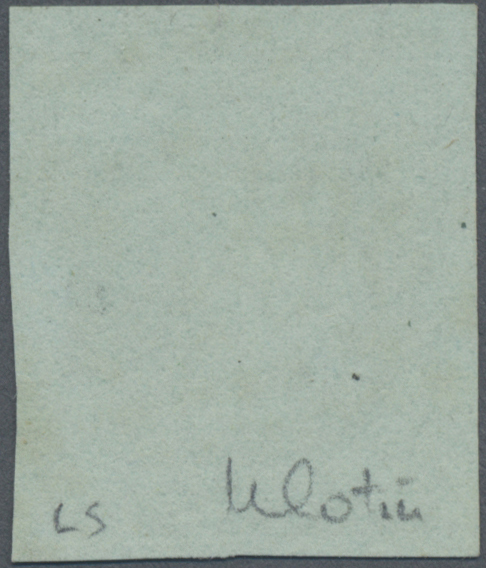 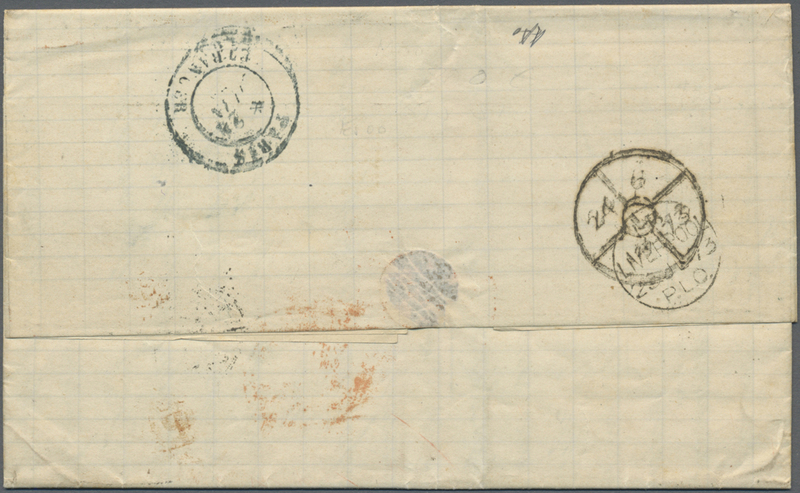 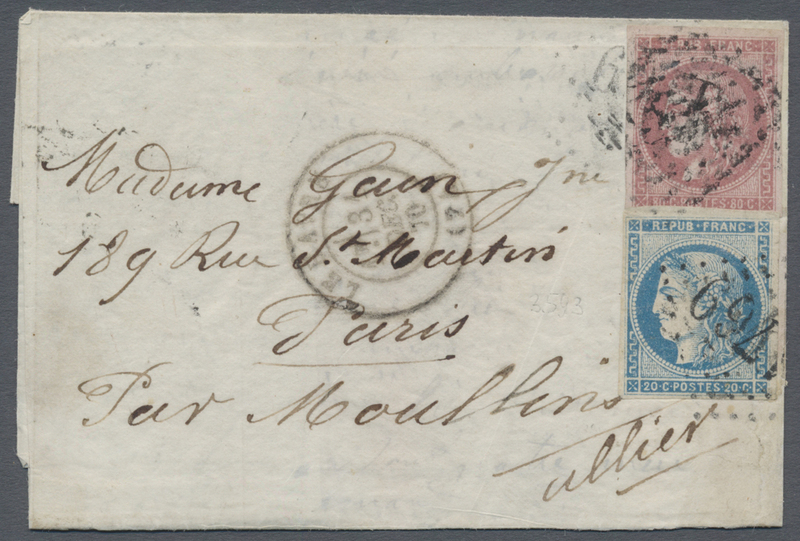 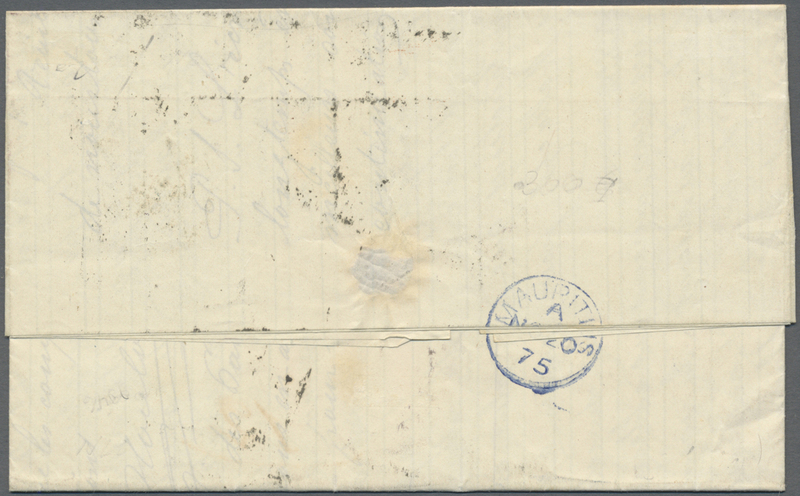 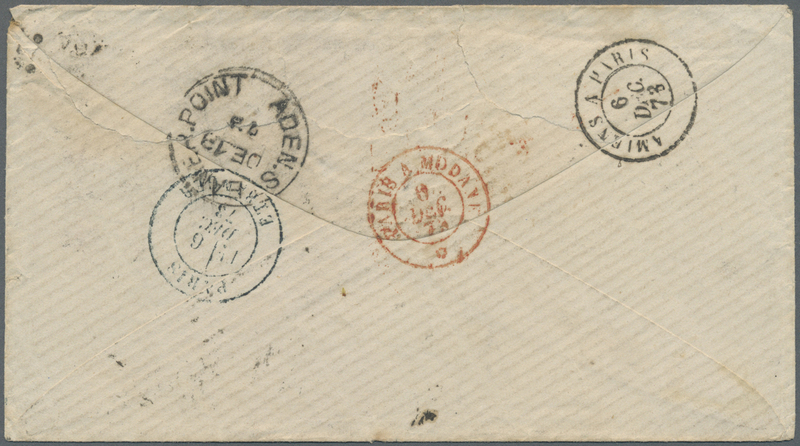 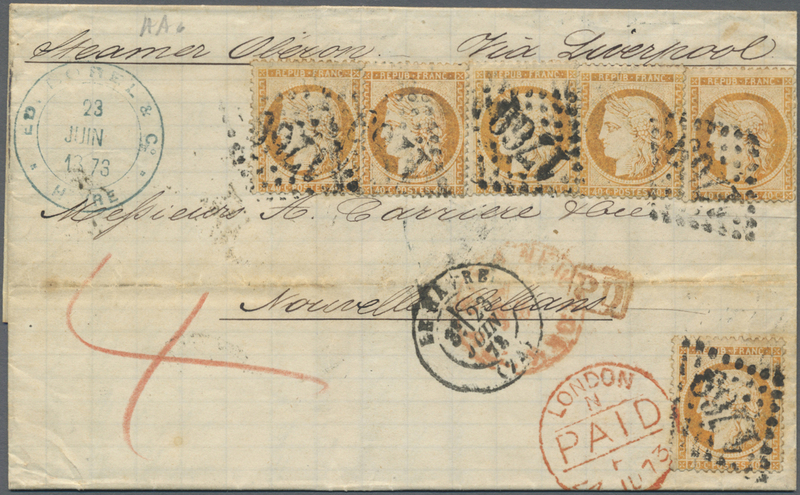 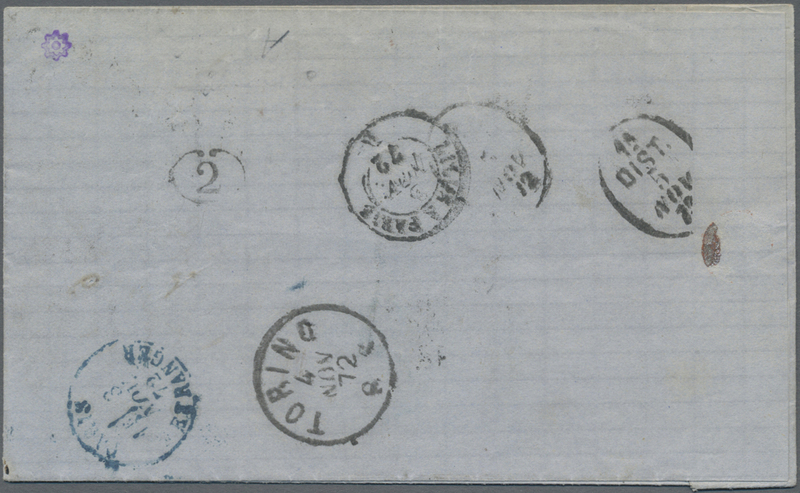 An attractive franking tied by a scarce numeral cancellation and a scarce destination. 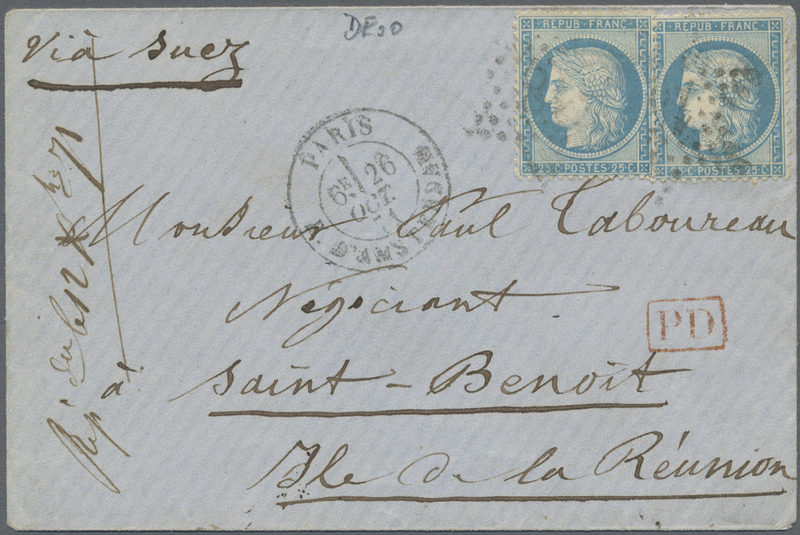 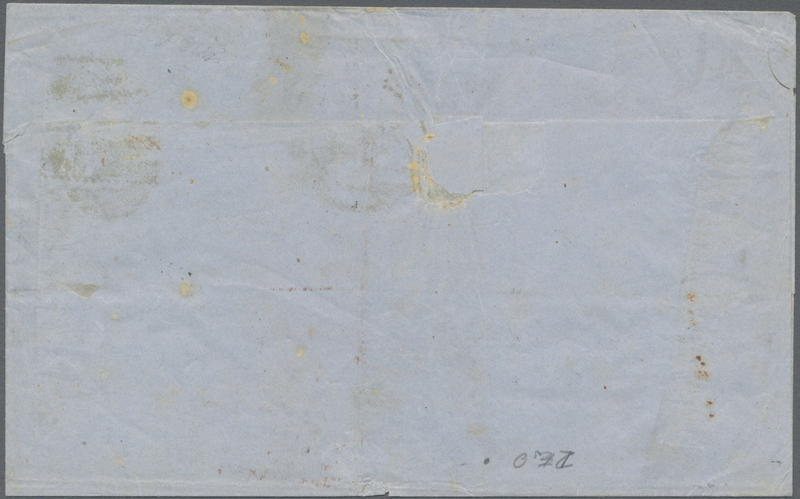 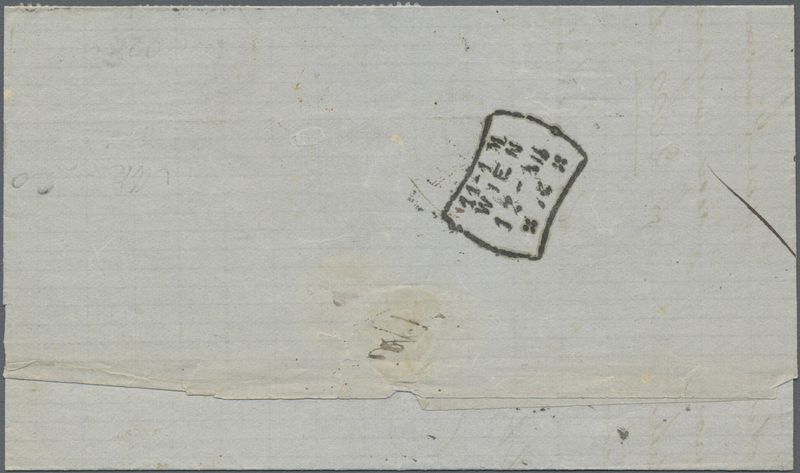 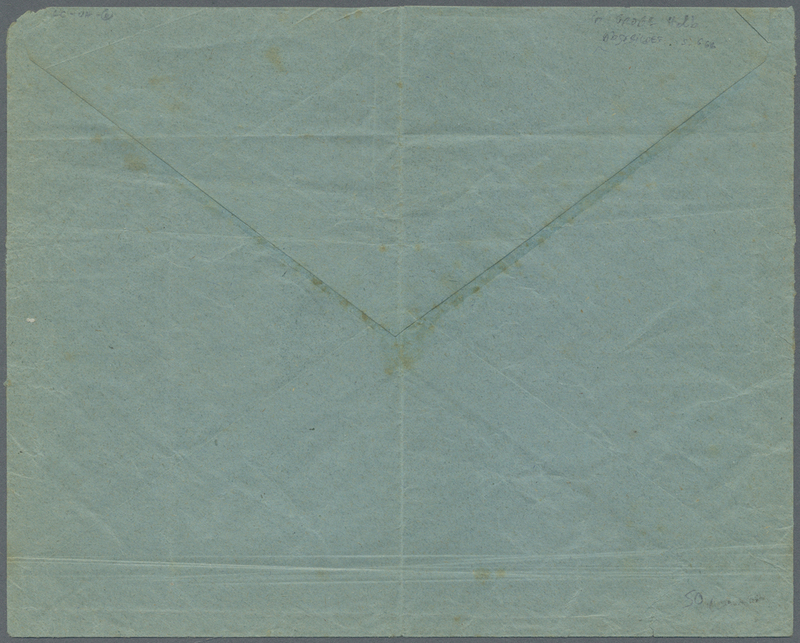 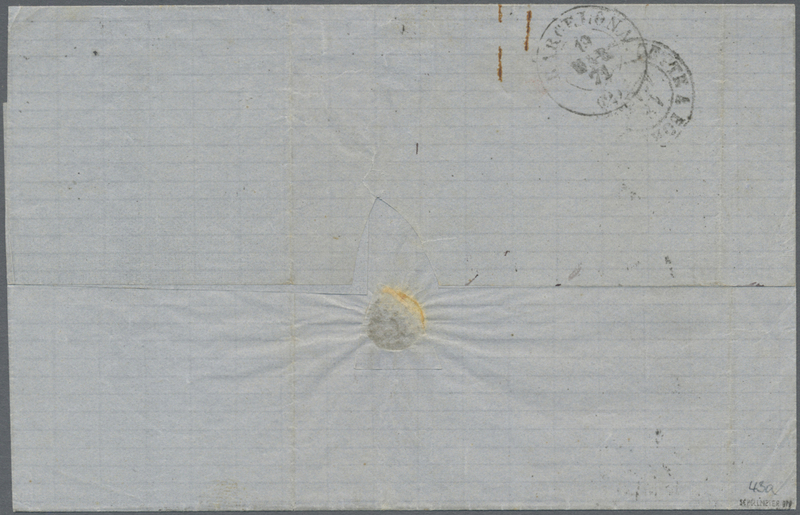 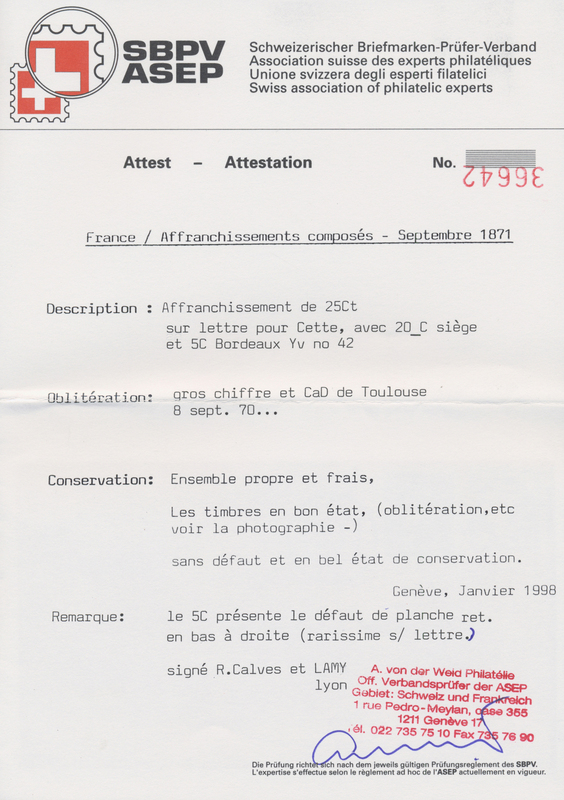 15643 Brief (cover) Fr. 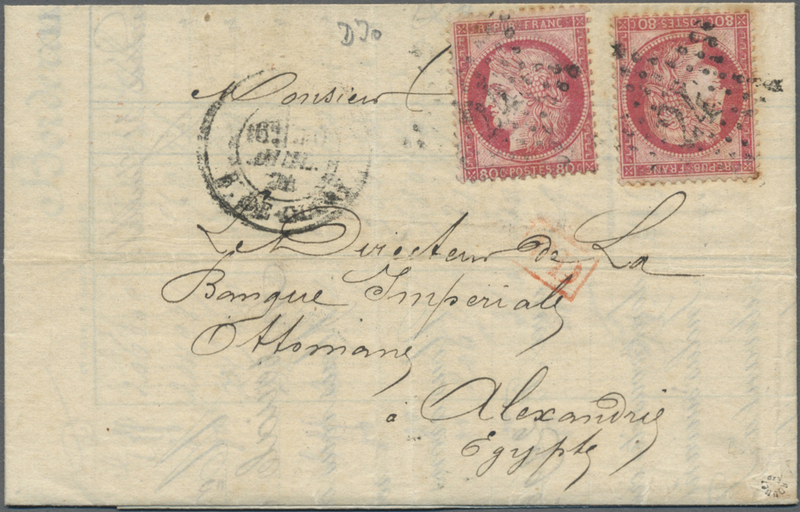 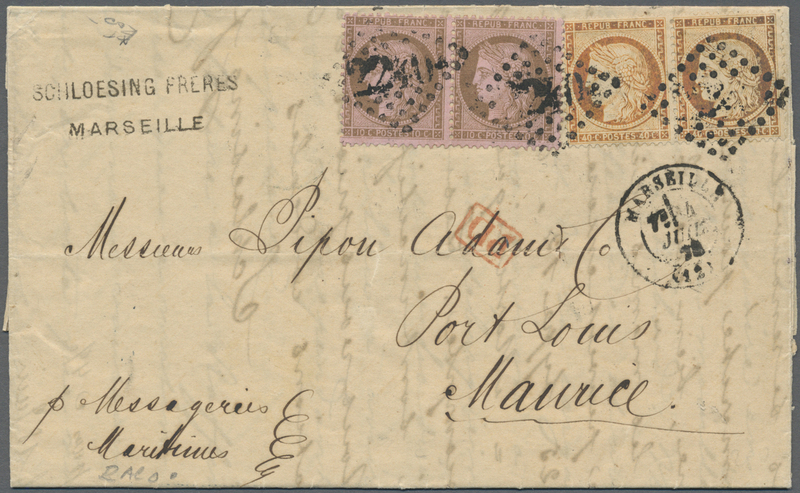 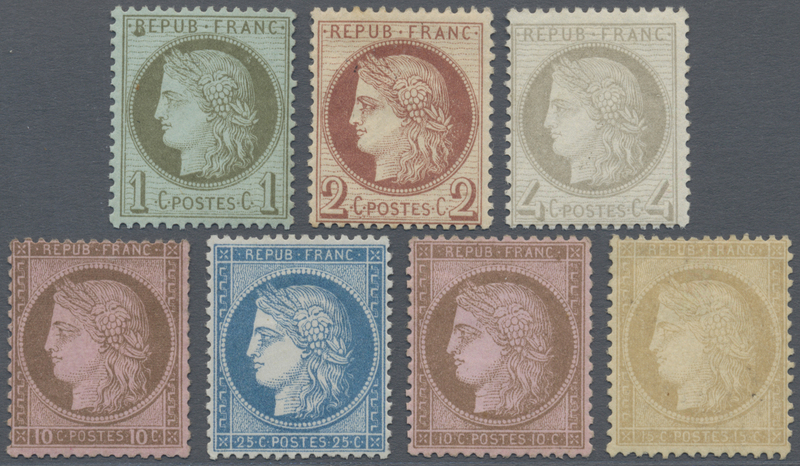 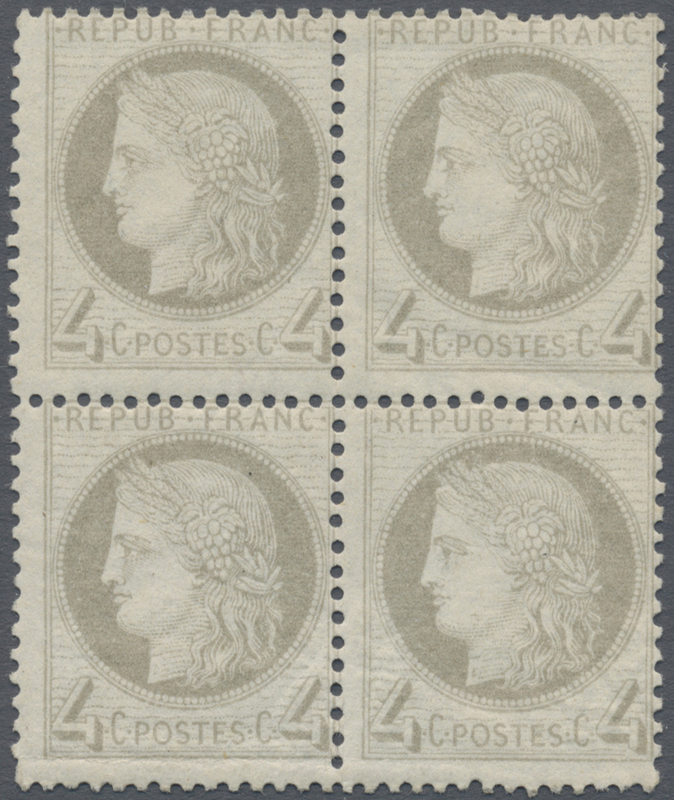 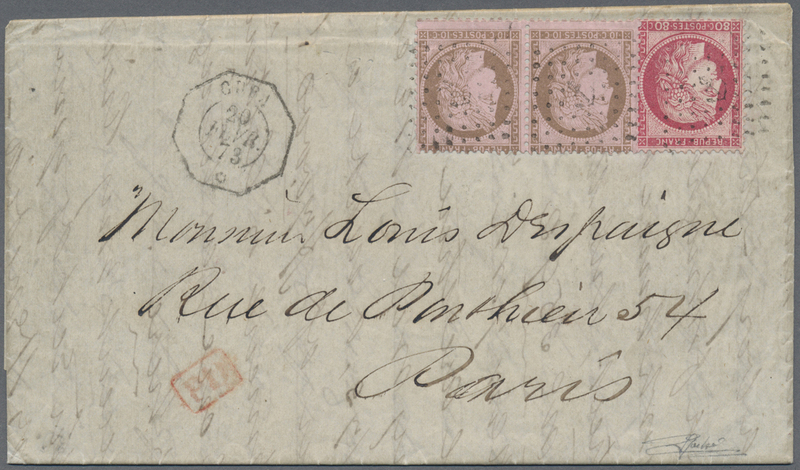 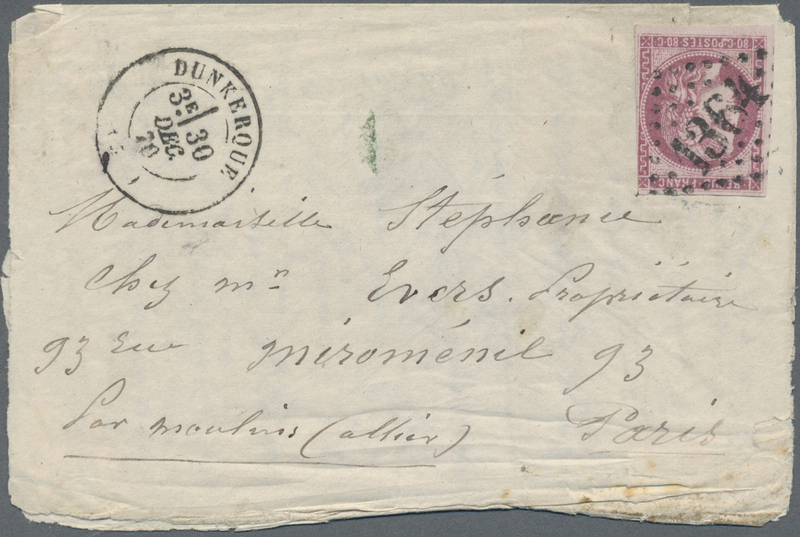 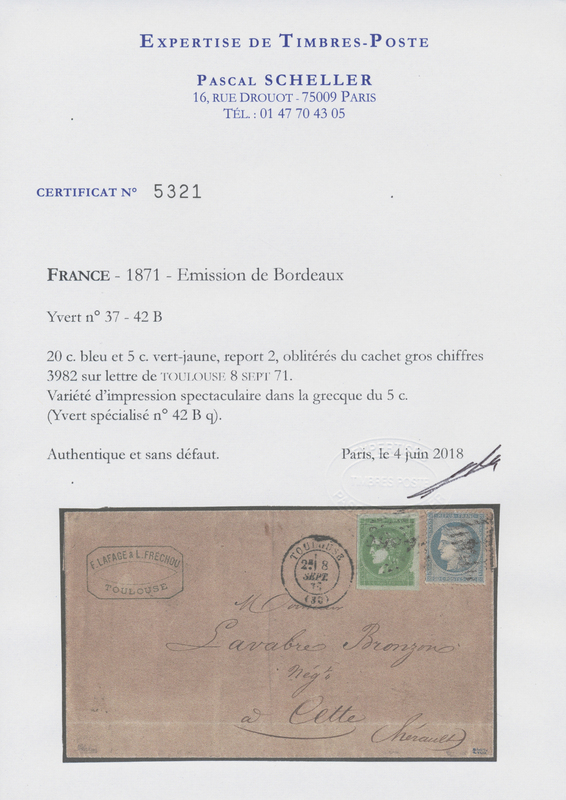 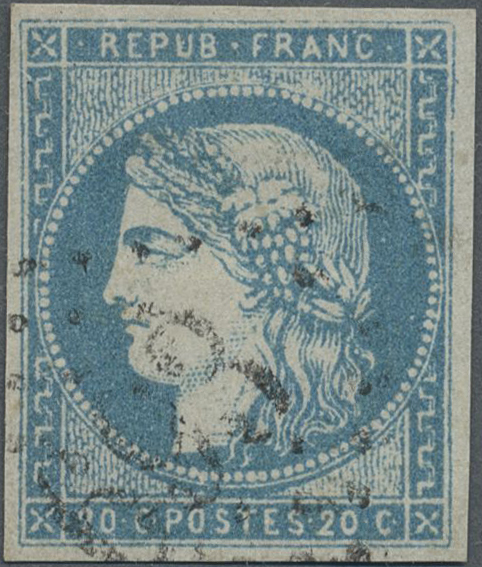 49 (2), 55 1874, FRENCH P.O., 10c. 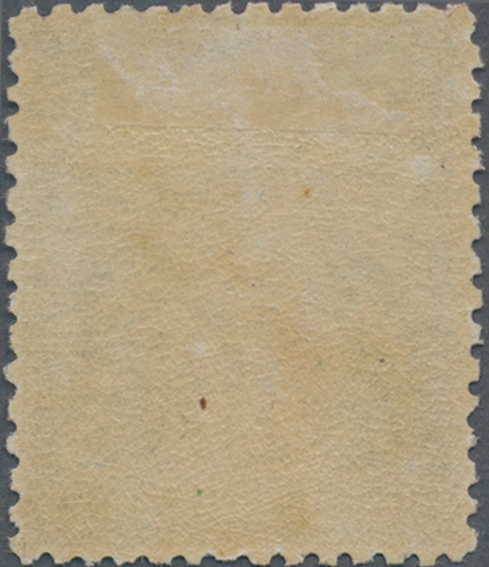 brown on rose horiz. 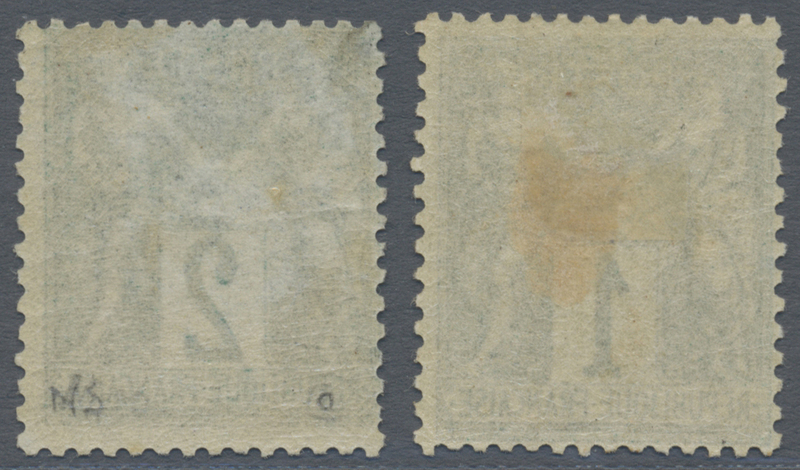 pair and 80c. 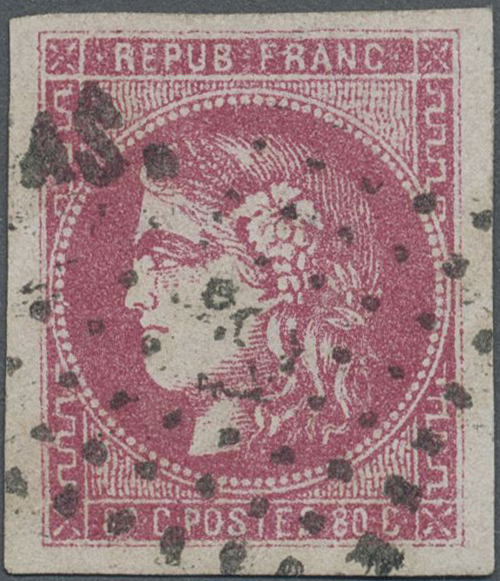 red, 1fr. 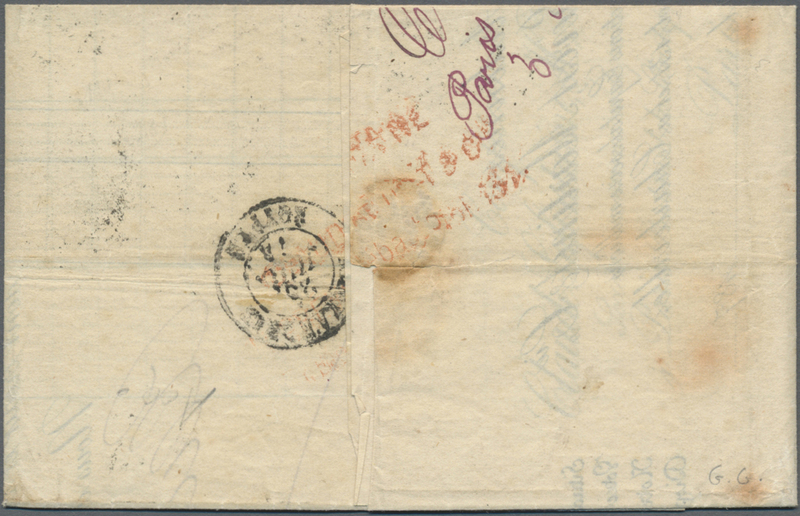 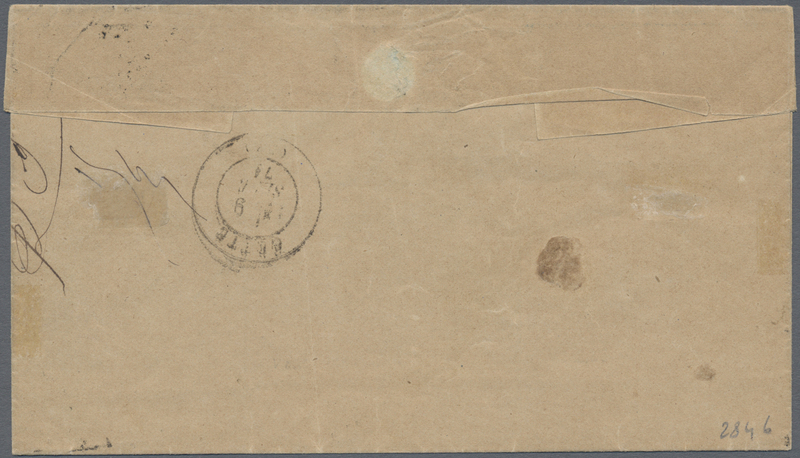 rate on lettersheet with complete message written at Santiago de Cuba 21 Febr. 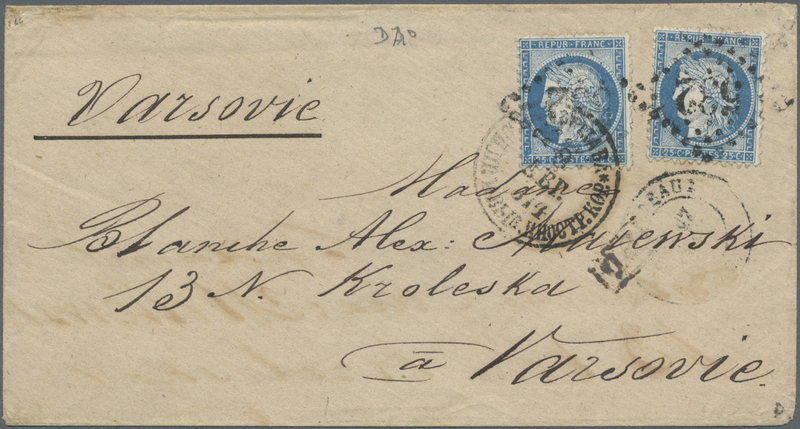 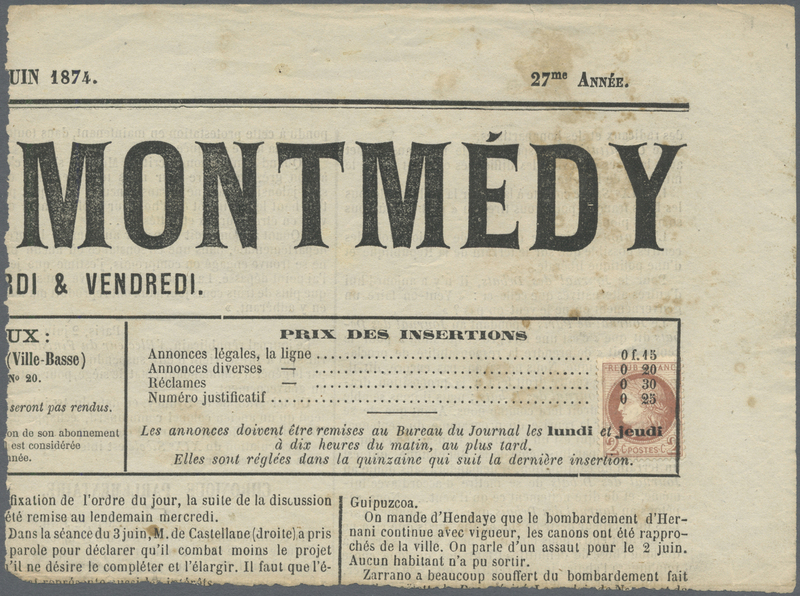 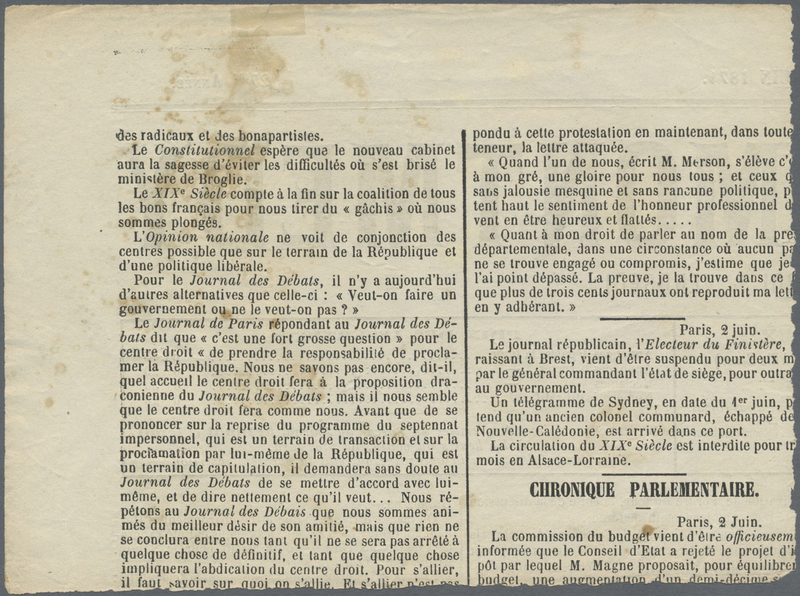 1874, oblit. 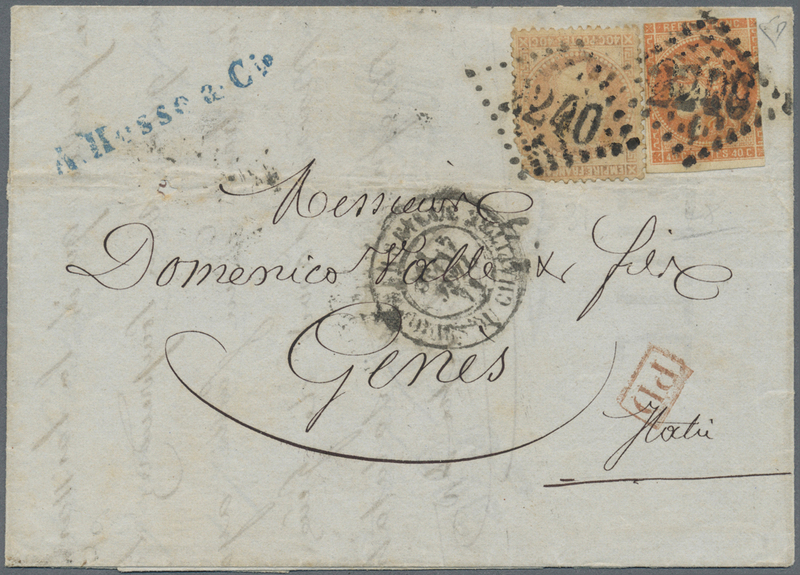 by losange ancre and c.d.s. 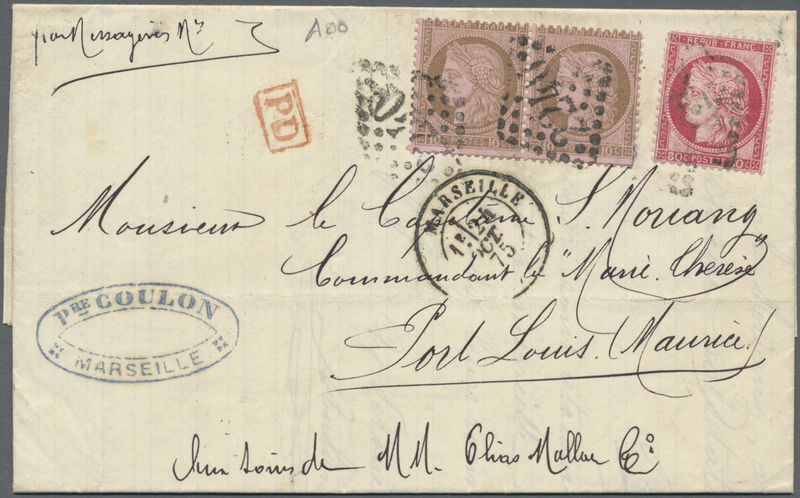 "CUBA 20 FEVR 73" (error in year date) alongside, addressed to Paris with French steamer 1 Mar and Paris arrival 19 Mar on reverse, signed.